The loudest, biggest spenders don’t win anymore. The smartest, most flexible listeners do. Social media is a big deal these days. Whether you’re looking to sell or you have something to say, platforms like Facebook, Twitter, and other social networks are the new sounding board—and the new way to connect. If you’re a blogger who’s managed to reach any audience, big or small, then chances are you’ve learned firsthand the power of harnessing social media. Dave Kerpen knows it. He wrote Likeable Social Media (on Amazon and B&N) to spread the word in print and online. I’ll say this upfront: If you’re a blogger, freelancer, or any young or progressive person who’s fluent on the web, then Likeable Social Media won’t tell you anything you don’t already know. The book is aimed at business professionals and marketers who were taught that pushing a brand and products on consumers through television, radio, and print ads was the way to be seen: You just had to be smart at selling it. Likeable Social Media explains that a new wave of advertising has begun, and it’s lighter on the legwork of actually pitching products. It’s about building a fan base and rewarding a loyal audience—it’s about them, not you. Sorry. Respond to every comment, good or bad. Thank people for positive feedback (or feedback at all), encourage them to return, and address negative comments as quickly as possible—that’s the really important part. Be diplomatic about it. If someone’s unhappy and it’s your fault, don’t delete the comment or ignore it, hoping it will go away. Let the commenter and everyone else know that you’re listening, and consider extending an olive branch apology—a simple “I’m sorry” will go a long way. Make the conversation about them, not you! Engage with your readers as often and as deeply as you can. Be real and authentic. Show some personality and let people see the person behind the computer. Be human. 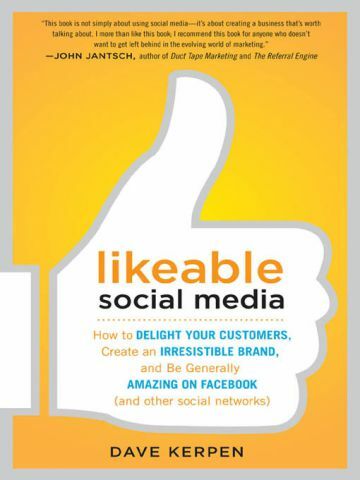 Revealing yourself as a likeable individual will endear you to your audience. Be open, honest, and approachable. Ask questions that touch on any of your readers’ possible interests. Don’t limit yourself to what you personally are “selling.” Let the conversation flow where it wants to. Use storytelling as a means to connect with your readers. Let people get to know you better! Sharing on a personal level doesn’t have to mean drudging up your personal life, but it does mean breaking down the barrier between writer and reader and letting them in. How are others supposed to support you and advocate your work if they don’t know anything about you? Do giveaways, contests, promotions—anything that will reward dedicated readers and encourage new ones to join in. Create “wow” moments to surprise and delight without asking anything in return. Provide value. Share info and tips about your area of expertise freely, even when it doesn’t directly benefit you. Don’t horde good information. It comes out eventually, and if someone beats you to it, the people listening will be grateful to him/her, not you. Don’t sit in a bubble, either. Branch out—link to others and don’t always claim information as your own when you found it through someone else. Share and give credit where it’s due. Remember these four essentials: listening, transparency, responsiveness, and engagement. Open your ears to the conversation around you, show people the real you, be attentive to what people say (and let them know you appreciate them saying it), and encourage them to speak up! How do you connect? I reach out on Facebook, through Twitter, Tumblr, and more. Blogger Kristen Lamb wrote a great post about improving your “likeability quotient” as a blogger. Her book, We Are Not Alone, is all about using social media the right way. Ermiliablog praises The Thank You Economy (a book I’ve added to my wishlist recently) and Tweet Right, if you’re looking for more recommendations on social media at its best. This is geat stuff! We are new at this. This is soooo helpful for someone like me who struggles sometimes in the social media world. Thank you for those tips. No problem, Sarah. Thank you for reading! Hope the tips help. Thank you for mentioning our blog. I really liked your review too. From the 1-9 list, it looks very similar to The Thank You Economy principles, which was also written at business and professionals who think pushing their products and one-sided flashy demonstrations are the way to get an audience. I think number 6 worked best for us as bloggers. By hosting a contest to help fill in our character gallery for Odette, we got to connect with artists and bloggers we never would have come across otherwise. We plan to do more of this now that our book is releasing in March and we have something to actually give away. It’s my pleasure! If something’s worth sharing, it begs to be shared! I know giveaways can work wonders, and it’s a great way to connect and get people involved—and show them you care. An author on Twitter gave me the idea to give away free short stories based on the novel. I liked the idea at first, but I’ve read some free shorts and didn’t like them much. There’s a whole different style to writing a short as opposed to writing a full length novel. Might give away free cut scenes or something though. I wish we had the money to give away free Blind Sight merchandise. I love giveaways… sometimes too much lol.